We did have an excellent turn-out. The airfield was surrounded by ground fog, but Kingsbury itself was clear! The weather warmed up nicely and we got a lot done. 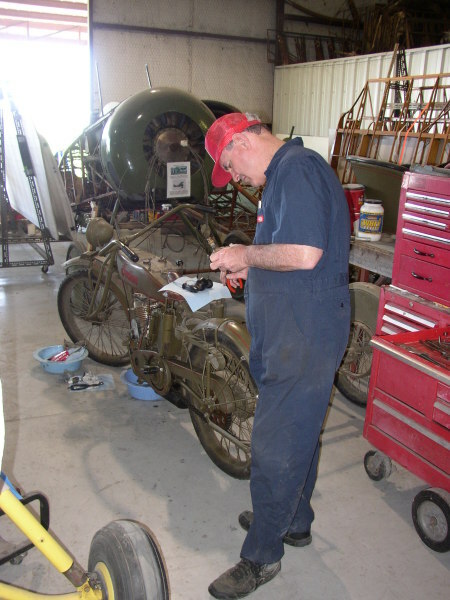 Dave Edgerly and Dave Orloff went to work doing an annual inspection on the Curtiss Canuck under Roger's supervision. They made such good progress the engine was ready to run mid-afternoon! Incredibly, the engine starting the first attempt and ran well. If everything else got completed the Curtiss may be flown next work. Myself, Dave Miller, Ron Marcotte and Greg Solberg went to work on the D.VII fuselage. 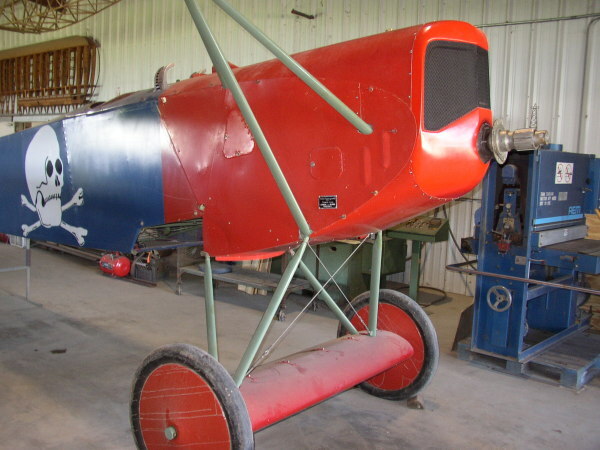 This airplane had already been disassembled for transportation to Houston for Keels and Wheels. Kurt Maurer is carving a full size genuine Fokker D.VII Axial wooden prop for the airplane, and most of you have seen progress photos of the prop coming together. We expect to be able to fit this prop to the hub next workday! We needed to address the prop hub issue though. We elected to use the hub from the toothpick prop and create a new front plate on Roger's laser cutter machine. The toothpick prop / hub was disassembled and the crankshaft nose and the hub's splines were cleaned and dressed to allow the hub to sit as far back on the crank's nose as possible. Ron and Dave Miller got that to happen. Roger still needs to cut the new front face plate. And we may need shorter bolts to make it all work. 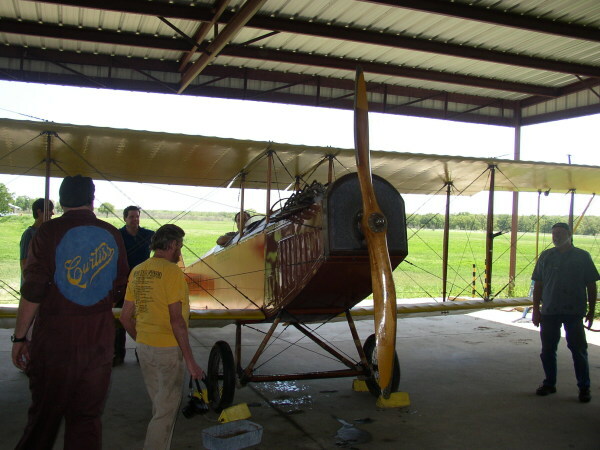 The other D.VII task was to wash the main wings and build up the trailer structure for transporting the wings to Houston. Tom Miller directed this effort all day, got a lot of help from Chili. There was still a little left to do on the trailer at the end of the day - a tire needs work and the 2 X 4 structure carrying the wings needs trimming and labeling. The tail surfaces need washing and placement on the trailer. So that work will need to be finished next work day. So all in all it was a fun day and lots got accomplished! Team Vehicles had an interesting day. First on the agenda was the model TT which was running rather weakly since the last workday. Cameron W., Lynn, Ian W. , and a Mr. Whitaker (Mr. W.) whom I did not get the first name, kind of ganged up and got the TT purring like a kitten. Lynn added an fuel filter and adjustments were made by the Whitakers to the sparkplug wires that were being pulled excessively by the spark advance lever and of significant importance it was found that the throttle rod that runs from the steering column through the engine to the carburator was badly bent due to being bent to accomodate a water pump many years ago. The problem was the rod was bent in another place making the rod too short and thus the carb lever was not permitted full travel which prevented low idle settings. An old rod to something was found in the pile of Model T stuff and was modified by the Whitakers to fit and now the TT purrs at idle. No question all the work contributed to the smoother running fo the TT. She slips into second effortlessly and also served as a personnel transport for the volunteers between the old hangar and the shop. The signal corps truck did some running also. While "the Whitakers" did some additional prep on the US Ambulance (where it was discovered that four oil pan bolts were missing allowing a lot of oil leakage), Lynn and I did some measuring and planning for the roof of the TT. Hopefully this will be something we can get done over the next few months. We will need to order the oil pan bolts. As Tom and Chili were working on the frame, team vehicles (the dark side according to Tom G) assisted the (the side of light-team airplanes? Really?) in washing the DVII wings and then putting them into their sandwiched positions into the frame, a very delicate operation. Tom and Chili worked tirelessly on the frame to get it ready. Doug worked on the Indian solo. He discovered that the kick starter spring was shot and I have ordered another. He also retested for manifold leaks, and despite the cleaning and refitting that Dave B and I did there is still a lot of leakage. Doug is considered a modification to the manifold system to end this issue but there is also a quick, maybe temp, fix being discussed. Oddly like what was discovered with the TT throttle rod, Doug discovered a repair in the carb lever which was keeping the throttle from operating at a lower throttle setting. He has fixed this and this might prove very helpful to the low speed running of this bike. Terry and I (mostly Terry) installed the fuel tank on the PFM Motorcycle and I think it looks awesome. Terry also adjusted and did some grinding to get the rear axle stand to work properly. I think we are there are now. I am currently working on some cosmetic shields and stuff for the bike that will enhance its looks. I hope some pics will surface as it is closer and closer to being ready. Still have to modify the clutch lever as it came from the factory put together wrong. I allowed some parts here and there to disappear that I will have to replace.